Hands down I was through the roof excited for our little miracle when we found out she was on her way. I thought of her little feet and her little hands and holding her and every single delight, joy, worry and fear that runs through a new mom-to-be’s mind. 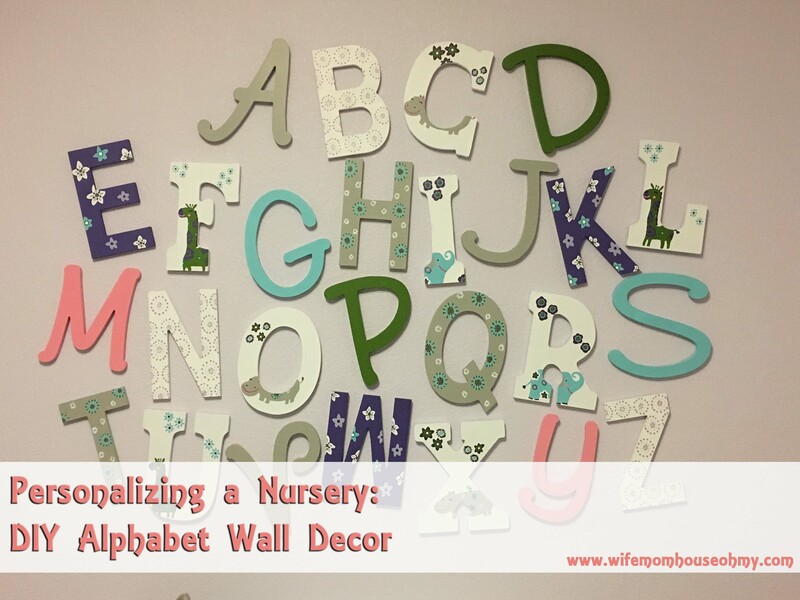 But one delight that had actually been mulling in my mind for years was a nursery. What would it look like? Would there be a theme? Would it be traditional? Would it be modern? What say would my hubby have in the design? (Okay, really come on moms you have to admit, you have had this thought too.) My mind began going over the billion of ideas that had been floating in my head for years. And it didn’t matter that I didn’t know whether our sweet baby was a girl or a boy. I had ideas for both! And yes I’m secretly hoping God gives us another little miracle down the road to love and that its a boy…because I really want to design his room too! I do have a small confession…we kind of assumed our little bundle of joy was a girl. 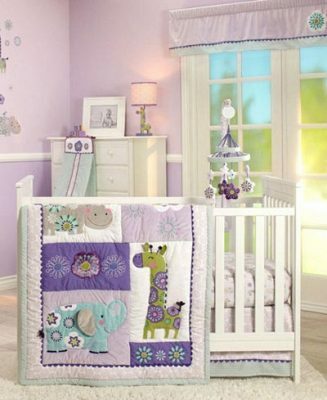 So much so at 5 weeks pregnant, as we perused Buy Buy Baby and saw this adorable lavender, gray, and aqua whimsical zoo bedding set featuring an adorable hippo, we bought it. (yeah…we really did.) I kept the receipt just in case we were wrong and our miracle was a football and race car miracle and not a flowers and furry baby animal miracle. As it turned out, our little bundle was a baby girl and this little bedding purchase would be the jumping off point for our sweet baby girl’s nursery. And BOY did I have fun with this room. 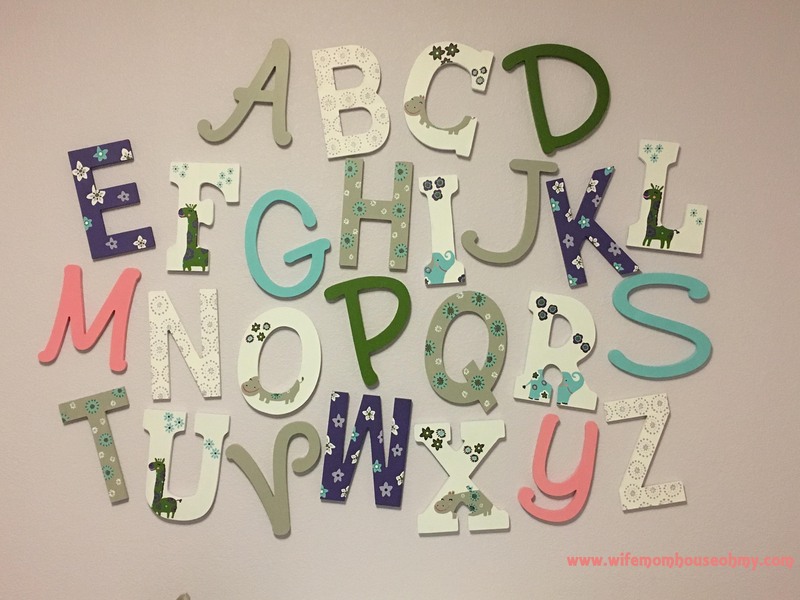 One thing I had dreamed about doing for our little girl was a whimsical alphabet wall. And while this one I really did have to fight for with respect to what my husband wanted, I ultimately am so glad I did it. Frankly, I was right. It was the perfect filler for the blank wall above her changing table and in the end he loves it too. (Note to self: Definitely worth fighting for and reminder to stay strong for my passions.) It was a labor of love and somewhat time consuming but a project that makes her room unique. Before I did anything, I made sure I had paints that matched the colors of the nursery set. In fact, I sat with the quilt and took each color and tested it against each one in the quilt. I wrote down which colors would be associated which each specific detail of the quilt. This reference ended up being very helpful as the layers of color were added to the letters. Figuring out where each letter would hang on the wall was critical as I wanted to make sure I didn’t end up with two similar styles next to each other. I tried two different layouts based on the width of the changing table that would be below it. The first was a four row layout and the second was a three row layout. Ultimately because of the height of the wall and the closeness of the change table to the bookshelf, I elected to stick with the four row layout. My husband suggested a topsy turvy a skewed letter layout, which also suited the four row letter layout. In order to know where each letter was in the layout, I made sure to take a photo on my cell for reference. Next, I assigned a pattern and color to each letter, making sure to write it down. For the scroll letters, I decided they should be solid colors since they were thin. For the block letters, I elected to use some of the background features of the quilt. While these were larger than the scroll letters, they were still thinner and less suited for the animals in my mind. Which left the Time New Roman Script letters for the animals. Within each category of letters, I also assigned a specific color or style. The scroll letters comprised of four colors, the block letters featured three backgrounds and the three animal letters for the Times New Roman Script. I assigned a specific letter to each scheme using my photo of the layout to determine which each would be. I wanted to make sure that no two designs were right next to each other. With the colors picked, the layout settled and the designs determined, it was time to start painting and creating. 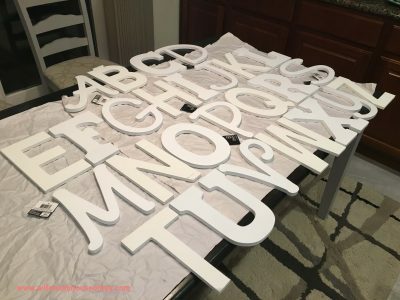 I painted each letter with a base of white. It seems redundant since each letter was already white but it served two purposes. First for the letters that would keep a white background, it made them uniformed. With three different letter styles, the whites ended up different. Second, with a base of white, it allowed the paint to have something better to adhere to. Think primer. Once painted, I let them dry overnight. In the morning, it was time to start the color. The easiest being the scroll letters but several of the background design letters would need a dark purple coat and a gray coat. 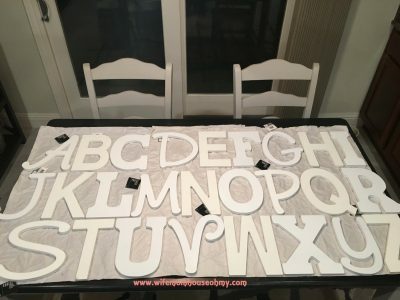 Even with the primer coat, each letter ended up needing at least two coats of paint and some even needed three to give it a deep, rich and fully covered look. With each letter having its base coat color complete, it was time for the designs. You can either use a projector to sketch them on or you can free hand it in pencil. I opted to free hand them. 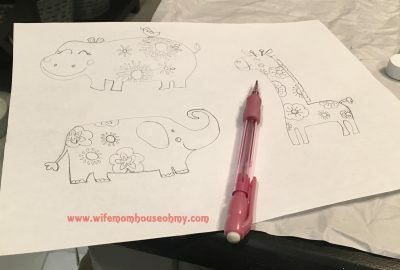 Though I will admit before I fully took on this project, I did do a test run of each animal to make sure I and my rudimentary art skills could pull it off. The last thing I wanted was ridiculous looking animals on these letters. Whimsical yes. Fun yes. But ridiculous no. 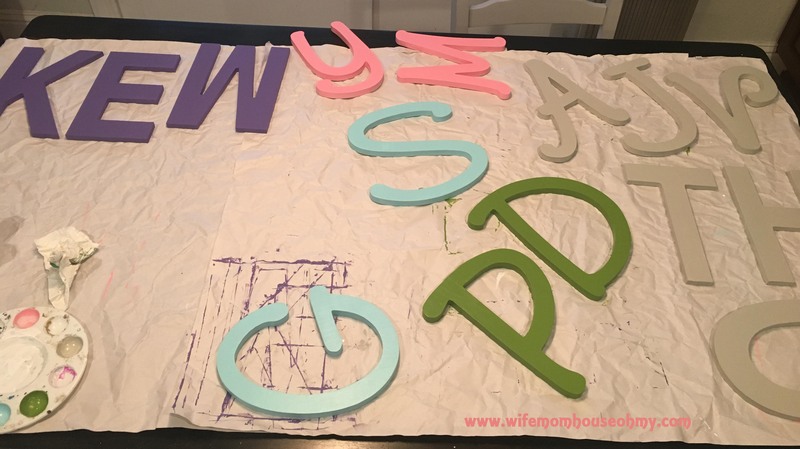 If you aren’t feeling artistically inclined, you can always do simple scrolls using the colors from your theme, paint each letter a different color, or as I mentioned before use a projector, or even cutouts or stickers. With all the sketches complete, it was simply a matter of layering color. 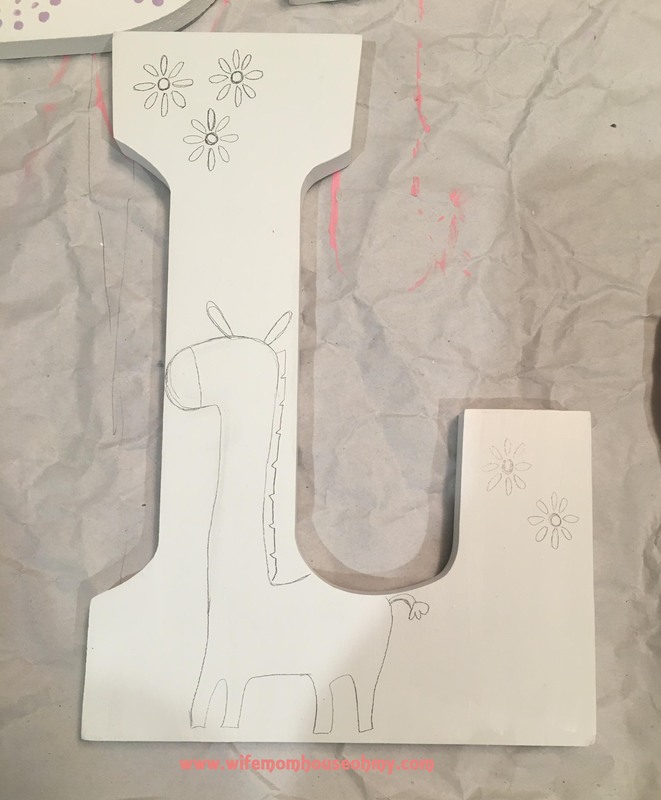 For example, the giraffe needs its base coat of green before he could get his flowers or mouth and eyes. The dark purple flowers needed the dark purple base before they could get their green centers or little spoke inserts. While this was definitely an easy process, it was time consuming. You have to make sure each layer is fully dry before moving to the next, which involves a whole lot of hurry up and wait. In the end, I think it came out A-MAZ-ING! But I admit I’m biased. Hanging them was another time consuming project. Even though each letter had holes for nails to be hung on the wall, some even had two, I really didn’t want to add too many nail holes to our freshly painted walls. I’d already put up a clock, hippo mobile, growth chart and three frames. The thought of about 50 holes kind of freaked me out. Enter Command Strips. I did a lot of research and the Velcro command strips work on my texture wall and each holds up to 3 lbs. Since my letters were easily less than a pound, medium seemed like the best option and perhaps even a little over kill. The process again was easy enough but it did take a lot of time. First, I washed the wall with rubbing alcohol to make sure it was free of oils and dirt. 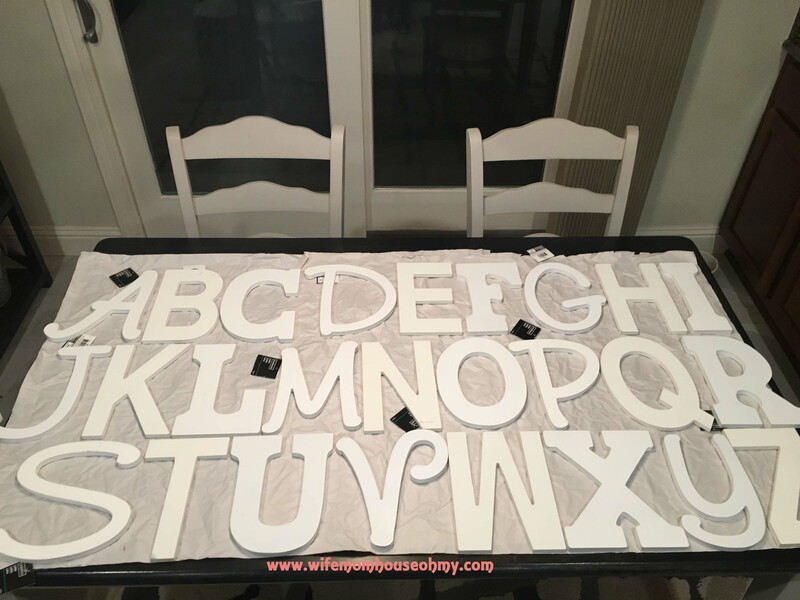 Then as the instructions said, I placed each pair of command strips on the back of each letter. Then pressed the letters to the wall. I left each letter up until the enter alphabet was up so I could judge spacing and placement. Once finished, I removed each letter as instructed. (Instructions say to leave frames or in my case letters off for at least one hour. As it was late, I left it overnight.) Then, I put each letter back in place, making sure to line up the Velcro strips. Most letters ended up needing two strips for stability, not so much weight, but a few I could get away with just one. In the end, I ended up using about 50 command strips. 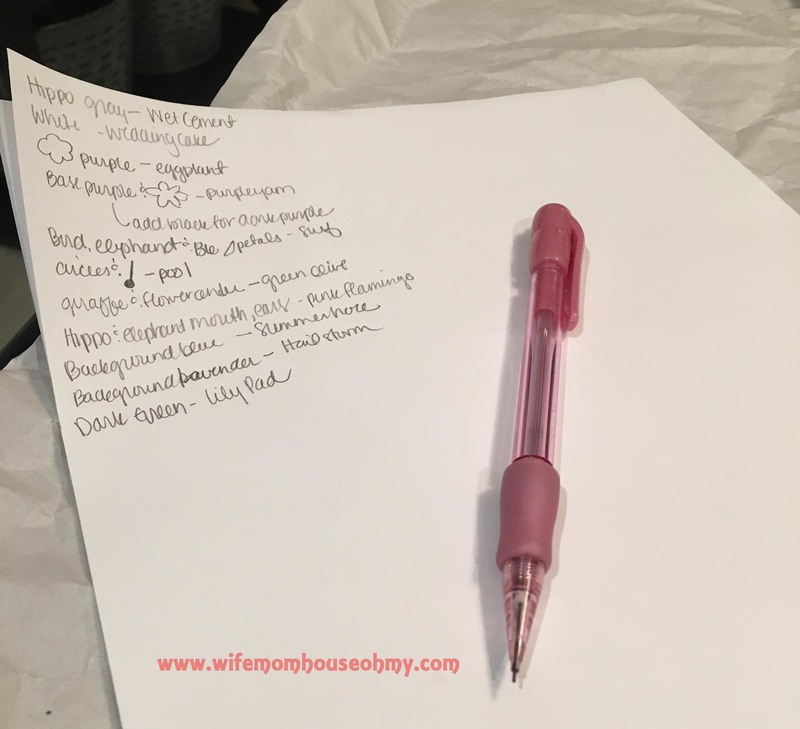 Next up, baby girl’s growth chart!